Coke Gearing is a leading commercial property agent based in Hertfordshire; they specialise in offices, retail premises and industrial warehouse property throughout Hertfordshire, covering Bishop’s Stortford, Stansted Airport, Harlow and the M11/A120 corridors. 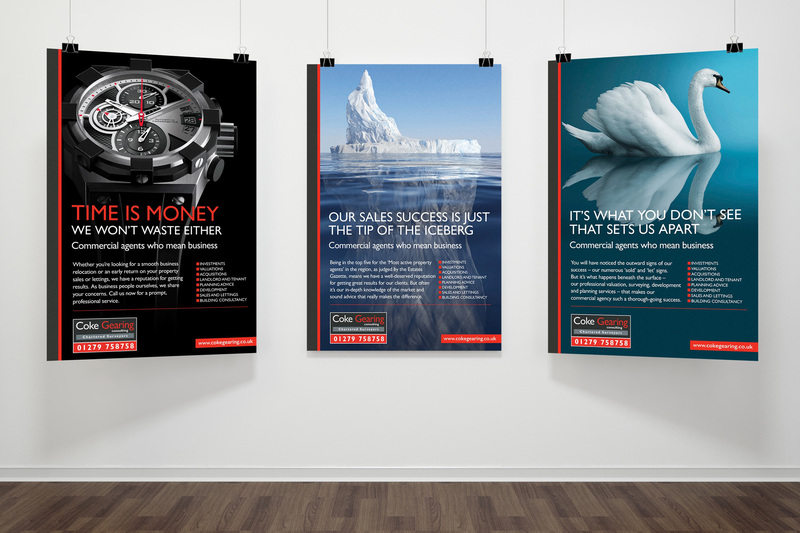 Coke Gearing is a long-standing client of Simpsons Creative; we have worked closely with them over the years on a range of projects from rebranding core areas of their business, to rebuilding their website. 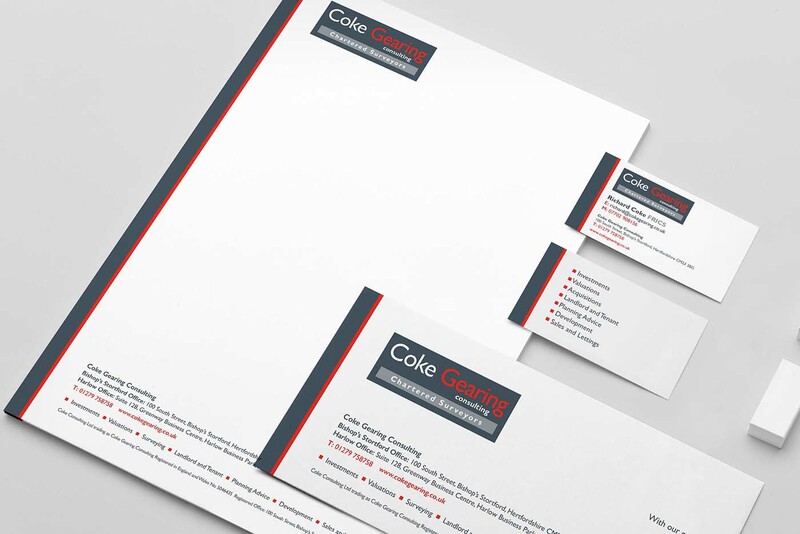 Coke Gearing asked us to carry out a review of their marketing materials and branding as the company has changed and grown significantly in recent years and was in need of a refresh. The most obvious areas to focus on were the everyday marketing tools such as logo, sale boards, website, stationery and their flagship property magazine ‘Property Matters’. In addition they also asked us to consider sales messages, headlines, copywriting and visuals for direct mail and filler advertising. Our starting point for this project was the logo, we had created the previous one for Coke Gearing, a typographical approach with an appropriate professional colour scheme that would be present throughout all of their work and marketing materials. We have updated and developed this further by making the font tougher so that it stands out and giving it a stronger visual impact. We also supplied them with their own, tailor-made stationery which featured their new, modern branding throughout. This included letterheads, comp slips and business cards which have been personalised to each member of staff, to reinforce the professional look. Other areas of the business which received the rebranding treatment include: property signage, property listings for newspapers, advertisements and more. Reviewing all areas of the client’s businesses allowed us to ensure a consistent brand image throughout the company. 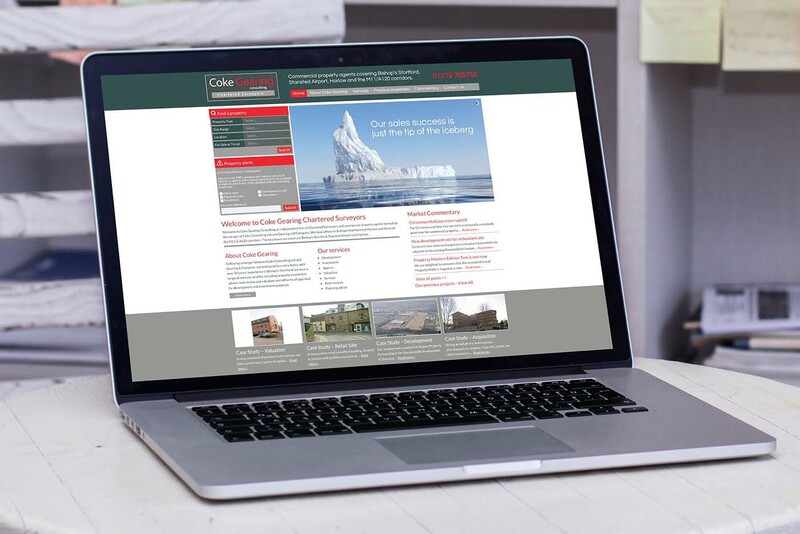 The new Coke Gearing website was introduced as an upgrade to their existing offering, bringing it fully up-to-date with the latest web trends. The website features a content management system (CMS), which allows Coke Gearing to quickly update different areas of the website, without the requirement for technical experience. The client is able to edit the copy on the website themselves, as well as create, edit and manage a portfolio of properties. The website features striking ‘Call to actions’ throughout, encouraging visitors to interact with the site. The website also includes a range of additional features, such as the ability to search for properties and sign up for email alerts. 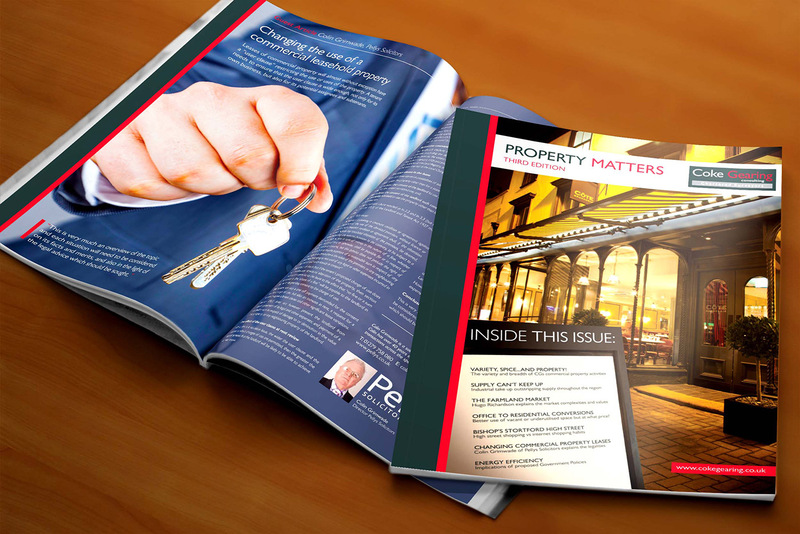 ‘Property Matters’ is a self-published magazine that we have helped Coke Gearing to design and develop over the past year; it features market commentary, as well as the latest commercial property listings in the Hertfordshire area. It has been a key marketing tool for our client, drawing attention to their extensive knowledge and understanding of this sector to, not only the industry, but also to potential clients. The other function of the magazine is to show the latest available properties and demonstrate the different types of commercial property that are on Coke Gearing’s portfolio. This, in turn, helps to attract new property listings to their books. Our aim is to establish Coke Gearing as a strong and recognisable brand for Hertfordshire and the A120/M11 corridor, ensuring that they are the go-to agents for the most significant, retail, office and commercial property deals.